It's Christmas Time! Pull out the Crackers and the wine, because it's time to celebrate! Okay enough jibber-jabber! It's time to move onto the video of the week, so here we go! Aitai Lonely Christmas by C-ute! So, this video can only mean one thing, right? Correct! It did indeed win the Poll, but where did the other guys come in? And those are the results! Sadly some song choices weren't chosen, but we can't really do anything about it now, can we? The one obvious song won of course (everyone loves that song, haha) and is obviously being featured as the video of the week! Maeda Atsuko will appear on MUSIC STATION SUPER LIVE, which is scheduled to air on December 21st from 6:53pm. This will be Maeda's first appearance on Music Station since her graduation from AKB48. Whilst this will have aired by the time this Digest is up, it's great to see that Atsuko fans will have a chance to see Acchan appear on a music channel again. AKB48 will also be appearing on the show, so Acchan will be able to meet with her fellow members again on the stage and hopefully sing with them, or maybe she will sing solo? Who knows. Hopefully everyone who watched the performance enjoyed it. It has been announced that AKB48's Takahashi Minami's solo debut, currently untitled, is set to release under NAYUTAWAVE RECORDS in the spring of 2013. The song has also been chosen as the opening theme to the upcoming drama Saki, which will begin airing on January 8th. The song is said to be a dramatic and emotional rock ballad which symbolizes TakaMina's solo debut. It's great to have an update on TakaMina's solo debut, and whilst I was hoping for an earlier release, we'll probably get a good preview through the opening of the show that the song is being used for. Hopefully more details will soon follow, so keep your eyes and ears open! It has been announced that Berryz Kobou will be holding a Fanclub Tour in Hawaii for 2013. This will be their third trip to Hawaii for a fanclub tour, two years after their second Hawaii fanclub tour. I'm honestly surprised that Berryz haven't been to Hawaii in two years for a fanclub tour, but with their recent surge in popularity - especially in the Thai market where the girls have become a lot more popular and well known - I'm not surprised that a new FC tour was announced for the group. Hopefully the girls will have an enjoyable time when the tour starts, and hopefully their fans will join the girls in Hawaii for a day of fun and watching their Idols perform. C-ute's will be in a stage play titled Sakura no Hanataba, and it will run from March 14th until the 24th. Stage plays are nothing new to Hello! Project, but it's always fantastic news to find out that a member or two are performing in a stage play together. It's actually pretty fantastic to find out that all of C-ute will be performing together for this stage play, and honestly, Sakura no Hanataba is quite a fitting name for C-ute as the girls themselves are just as refreshing as the spring season. I will be looking forward to seeing the girls perform and hopefully a trailer or snippets of the show will be released in 2013. Momochi will be a guest on the show Otameshi Ka! of TV Asahi on the 24th of December. The show will air from 6:30pm. Note the Momochi, and not Momoko, meaning that the infuriating pigtails will be back to haunt us all! Mano Erina's Best-of album has been titled. It will be called BEST FRIENDS. 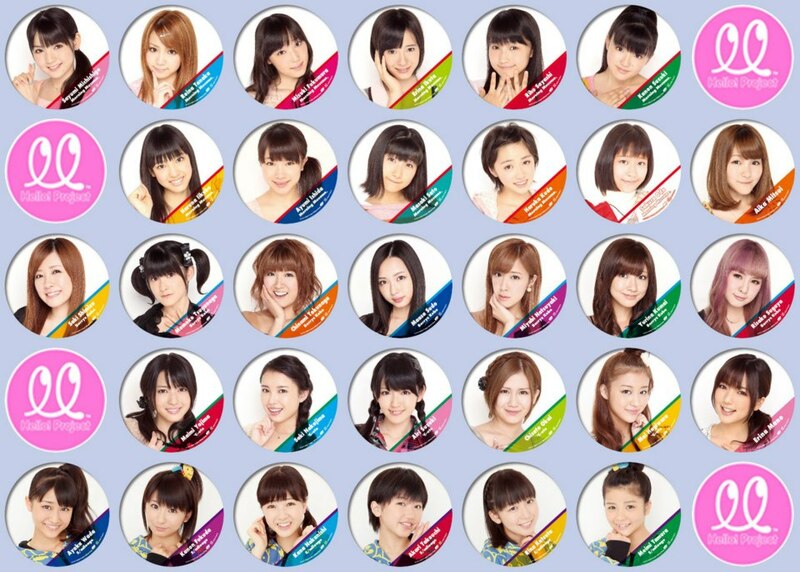 Announced via Nama Suma, it has been revealed that S/mileage second generation members will get their own radio show. The show will be titled S/mileage Station and will begin airing on January 6th, 2013. It will air from 1:00am until 1:15am. You can also send mail to S/mileage Station via ss1422@jorf.co.jp, so be sure to send in your messages! It's great news for S/mileage fans that the second gen members will be getting their own radio show, and it will be a great way to keep up with the girls! Sadly, 15 minutes is quite short, but it will still be a great way to keep up with the girls, so when it begins please tune in, and please send in your messages to the girls! Hello! Project and B.L.T will once again be collaborating with specially designed member shirts! It's great to hear that once again H!P will be collaborating to make special shirts for their fans with the help of B.L.T. Hopefully all fans will be able to buy a special shirt to support their favourite member! The cover to Fukuda Kanon's up-coming solo DVD, titled Dress up Kanon, has been revealed. When I saw the cover I as quite surprised, because I immediately thought of when Kanon was in LilPri. I also thought about how much the title suited Kanon as well, because to me Kanon looks and seems like a doll, so the title is perfectly fitting for her. Hopefully Kanyon fans can reserve a copy of the solo DVD, because it will be a great addition to any collection for S/mileage or Nyon fans. Kikkawa Yuu (I refuse to say You!) will be releasing a new single nd DVD on the 16th of January, 2013. On the 25th of January, Kikkawa will also be holding Kikka Fes 6 in Tokyo. It's great to hear that Kikka will be releasing something new for her fans, and whilst I'm not a big fan of hers I do like some of her music. Hopefully fans will anticipate the release! The duo voice-acting unit YuiKaori will be releasing their first single of 2013, titled Shiny Blue, on March 13th. There will be two editions of this single, a Regular edition and a Limited version which will include the music video of Shiny Blue. It's great to get news of YuiKaori's next release, and whilst it's a few months away I am excited already! After Ueika, I have high hopes for this duo. I love what they do regardless, and hopefully Shiny Blue will be just as good as their previous works. Anticipate up-coming details like covers or previews! I know I will! It has been announced that Nakajima Saki will release a solo DVD on February 27th. One question: WHERE'S THE COVER? Wada Ayaka' up-coming e-Hello DVD is titled Vivid Flower. Dawa looks gorgeous on that cover... Ah, is it bad that I want to marry her? A PV preview for Morning Musume's up-coming single, Help me!! has been released. But it reminds me of Mikan, which I liked, but that was before I became a judgemental cow. The digest to Wada Ayaka's up-coming e-hello DVD, titled Vivid Flower, has been released. Let the video enchant you with Dawa's grace and elegance. This is actually one of the best digests I have seen, mostly because Dawa actually knows what she's doing, plus, she's a stunner/corker/gorgeous! The short music video for Bakusute Sotokonda Icchome's Yoropiko Pikoyoro has been released, so watch and enjoy! But in all seriousness it's a pretty cute song, but not very memorable, either. It has been announced that the Hello! Project Kenshuusei will be holding their next live on March 31st. It's great to get confirmation on a date for the Kenshuusei's concerts, so now fans will be well aware of when to book tickets and places to support their favourite Trainee's of Hello! Project! 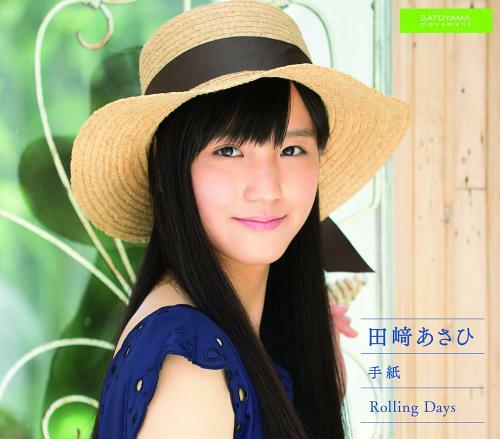 The cover to Tazaki Asahi's up-coming debut single, titled Tegami/Rolling Days, has been revealed. Much like the other Satoyama covers, this is a very simple but pretty cover. Whilst there is only one cover available, this release is a Double A-side for the new singer under the Satoyama movement, so hopefully that will mean two PV's to enjoy from UFP's latest singer. I am actually really anticipating a video from this girl, so fingers crossed that it comes out soon! It has recently been revealed that Mano Erina's best of album, BEST FRIENDS, will include 17 tracks. 14 will be existing, 2 are new tracks and there will also be a bonus track. The sound of a bonus track is extremely surprising, and of course I am really curious to know what that bonus track is. It might be a message or a song, who knows, either way I will anticipate the release or preview of the bonus track! C-ute's December 30th concert will be streamed live via Youtube. I wasn't expecting this news, but for all fans this will be something to look forward to and watch on the 30th. It's a great treat for the fans who can't watch it in the hall, and for international fans like myself, it will be a nice little gift from C-ute to see them perform on youtube. Make sure to tune in on the 30th and enjoy the show! Peaberry will be releasing their second single on Febraury 27th! This is amazing news for Peaberry fans, and confirms that the groups will be going ahead with new releases! Whilst details are scarce, I will be waiting patiently for the title of the song and whether or not this will be a collaborated single once again like it was beforehand. Hopefully all Peaberry fans will reserve a copy or wait patiently for previews and further announcements. Michishige Sayumi introduces the new Idol Hour Hello! Project for ENJ Radio, which will begin airing Idol Hour in January. It's great to see that the new Radio segments are being promoted already, ready to bring in a new audience. It must be hard for Sayu to speak in English, though, but she did a wonderful job! Everyone, please check it out and get excited for the new radio show which will cater to international fans! It has been announced that Kikkawa Yuu will be a regular in the TBS drama Hancho 6. This is wonderful news for any Kikka and drama fans. My hope is that the drama will lead to better promotion for the Idol, because it is one of the things that she lacked this year. Anyway, I hope for great success for Kikka and hopefully many people will tune into Hancho 6 to see her performance! On December 23rd it was announced that JKT48 will be making their CD Début in Indonesia this coming January. To commemorate their début, the group is planning to distribute 100,000 copies free, mainly in Jakarta. There will be a total of four versions of the promotional CD, with each version containing an AKB48 song from Heavy Rotation, Baby!Baby!Baby!, Ponytail to Shushu and Kimi no Koto ga Suki. Each version has been covered in the Indonesian language. These songs will also be included on the official CD release, and the title and trackl ists will be announced at a later date. Whilst I don't follow JKT48, it's great to hear that the girls will be getting a CD début next year. Much like HKT48, the girls will be releasing their first single and officially débuting like their older sister groups. Hopefully the début for JKT will include an original song, and hopefully everyone who is a fan can reserve a copy and enjoy what the girls produce! It has been announced that NMB48 will be releasing their first album on February 27th. Currently the album is untitled, however it will contain 6 of their singles, some coupling tracks, songs from their theatre performances as well as some new songs for their fans to enjoy. There will be four different editions to the album; Type N, M, B and a Theatre edition. Type N, M and B will all come with a DVD whilst Theatre edition is CD only. This is great news for all NMB48 fans and NMB48 themselves. An album release is important for all groups and those who are fans of that group, because it means a great collection of old and new songs that everyone can enjoy together, and for fans who prefer albums to singles, this will be great to add to a collection. Hopefully everyone will be able to wait patiently for further announcements, and if you're too excited to wait, then remember to reserve yourself a copy! And that, my dears, is all we have time for this week! Hopefully you will all have a wonderful Christmas or a wonderful day with your family. Please keep safe, happy sober or drunk, and remember to always love your Idols and fawn over your Oshi's happily! Until the New Year for our next batch of Digest goodness, have a very Merry Christmas and a Happy New Year! I KNOW *^* I want it, I love her now ;A; WHY DO I LOVE HER, MARA? YES TO AITAI LONELY CHRISTMAS~~~ I'm loving Help Me!! are you? :) Also I didn't know Peaberry were having another single! !